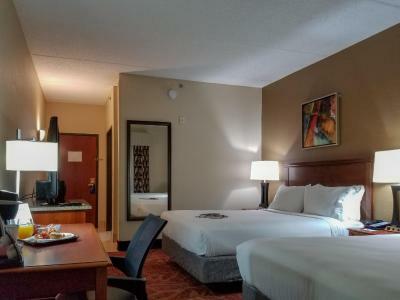 Lock in a great price for Holiday Inn Express Hotel & Suites Orange City – rated 8.7 by recent guests! I like how clean and well kept the property was. I liked the efficient check out. As a woman traveling alone, I felt very safe at all times. Wonderful staff that was very helpful. Will use them again. The staff...Kimberly offered to come in on her day off to take us to the airport.....Talk about going above and beyond. We flew into Orlando Stanford Airport and our car reservation was at MCO Orlando airport so we had some problems with our car rental. When we told Kimberly she volunteered to come in on New Years Day to drive us to the airport. We thanked her for her offer, but I thought she needed to be thanked more. there were cars that the windows were smashed.the police were called,and even asked me if I herd anything,since I was parked near oNE car that had all the windows smashed out.A little scary for this aera. The breakfast was very good. The staff was friendly and courteous. Overall very good stay from breakfast to the room. It was my second stay this year. It was very clean, the staff were very friendly, and it was in a great location. I enjoyed my stay and will definately stay there again in my future trips. 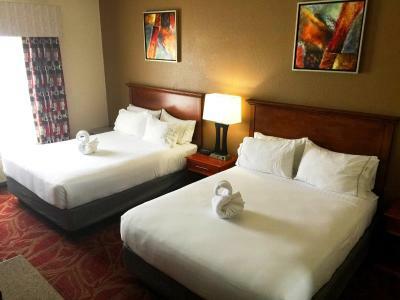 Holiday Inn Express Hotel & Suites Orange City This rating is a reflection of how the property compares to the industry standard when it comes to price, facilities and services available. It's based on a self-evaluation by the property. Use this rating to help choose your stay! Located in central Orange City, this hotel is adjacent to Deltona Memorial Gardens. Features include a outdoor swimming pool, free full breakfast, and rooms with free WiFi. A coffee maker,flat-screen cable TV, and hairdryer are standard in all rooms; most have a work desk with ergonomic chair. Carpeted floors and traditional décor are also featured in every room at Holiday Inn Express Hotel and Suites Orange City. This hotel offers a free breakfast buffet each morning. An on-site fitness center and business center are provided. Guest laundry and dry cleaning services are also available. The Orange City Holiday Inn Express is just 4-minutes' drive from Orange City Marketplace and 10 minutes' drive to Deltona Country Club. Central Florida Zoo is 8 mi away. This property also has one of the top-rated locations in Orange City! Guests are happier about it compared to other properties in the area. This property is also rated for the best value in Orange City! Guests are getting more for their money when compared to other properties in this city. When would you like to stay at Holiday Inn Express Hotel & Suites Orange City? 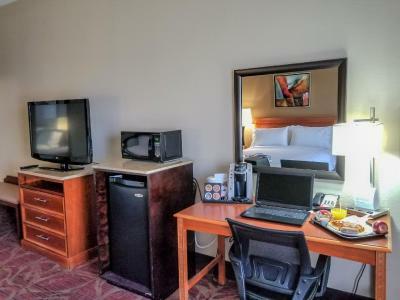 Featuring a 42-inch flat-screen Smart TV, this guestroom includes a refrigerator, microwave, and Keurig® coffeemaker. Featuring a 42-inch flat-screen Smart TV, this guestroom includes a refrigerator, microwave, and Keurig® coffeemaker. The private bathroom includes a hair dryer and a bath and shower. Featuring a 42-inch flat-screen Smart TV, this spacious guestroom includes a refrigerator, microwave, and Keurig® coffeemaker. The private bathroom includes a hair dryer and a bath and shower. This spacious suite includes a private bathroom with a walk-in shower and a divided room which includes a seating area. A wet bar, microwave, and refrigerator are included, as is a Keurig® coffeemaker. An ergonomic chair and 42-inch flat-screen Smart TV are provided. 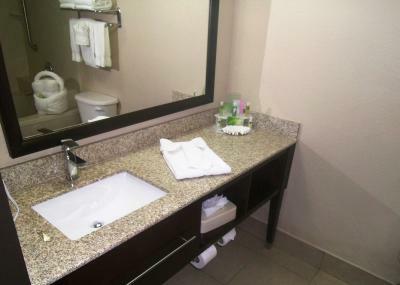 This disability accessible guestroom includes visual alerts, a standard bath with grab bars, and a 42-inch flat-screen TV. A microwave, refrigerator, and Keurig® coffeemaker are provided, as are a desk and an ergonomic chair. This accessible room includes 36-inch doorways, TTY visual alerts, and roll-in shower with a shower chair and safety bars. A 42-inch HDTV, microwave, and refrigerator are also provided. Note: A roll-away bed is prohibited in this room. From viewing endangered species at the Central Florida Zoo, hiking the trails and seeing manatee at Blue Springs Park, exploring historic downtown DeLand and fishing at the many local lakes, a variety of attractions can be found within minutes of our location. Be sure to visit the Mark Miller Gallery for a look at local and international works of art. Renovated in 2013 and among the top 6 percent of all Holiday Inn Express hotels for cleanliness. We offer the Express Start hot breakfast buffet free of charge; all rooms feature 42 inch flat screens, refrigerators and microwaves plus large bathrooms with granite counters. As of 2015 we have all new mattresses from Serta and feature bathroom amenities by Bath and Body Works. Enjoy working out in the Fitness Center and unwind with a dip in the outdoor pool and spa. We also offer free high-speed Internet, and 24 hour Business Center. House Rules Holiday Inn Express Hotel & Suites Orange City takes special requests – add in the next step! Holiday Inn Express Hotel &amp; Suites Orange City accepts these cards and reserves the right to temporarily hold an amount prior to arrival. Holiday Inn Express Hotel & Suites Orange City accepts these cards and reserves the right to temporarily hold an amount prior to arrival. Please note the Breakfast Included rate includes breakfast for 2 adults. Additional charges may apply for each extra guest. Please note guests must be 21 years of age or older to check in. A valid government-issued ID must be presented. The toilet would not flush right even after someone checked it. The bathtub looked terrible and the water pressure was not good. Also the breakfast could have been better. Never seen a breakfast in a hotel that did not have a waffle maker. Only potential item was the styrofoam cups at breakfast. They are standard in many hotel yet we personally prefer paper cups. Score still a 10, though. Awesome staff, nice hot tub. Everything clean and right. Some examples: no dirt anywhere, hot tub was not too much chloride (happens often in other hotels), very friendly staff, clean breakfast room, friendly breakfast staff, newspapers available for free, sufficient clean towels at pool, floors clean, well maintained property meaning no excessive wear-and-tear, proper protection strips for suitcase bumping near elevators etc etc.. First hotel on our trip that smelled fresh :-) The cookies are a nice touch, as well as they are tasty. Staff and hotel were welcoming and wonderful. Weak shower. Too much disposable plastic at breakfast! Honestly there wasn’t anything I didn’t like. It was close to where I needed to be. Very few places to eat within a mile of the hotel. Property was very clean and comfortable. Well lit parking area. Staff was courteous. The room was nice and bed comfortable. Loved everything on this visit.